Metallica resumed their 2018 WorldWired tour in support of "Hardwired… To Self-Destruct" in Herning, Denmark on March 27, and fan-shot video from the event is streaming online. The show at the city’s Jyske Bank Boxen saw the band deliver an 18-song performance that featured the tour’s debut of their 1991 track, “Holier Than Thou”, which also made its first appearance in the set since 2012. 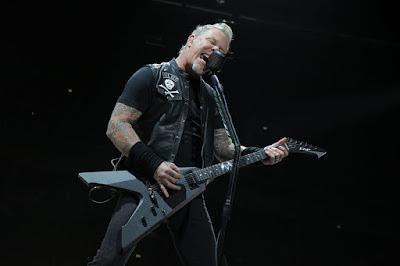 The Herning gig marked Metallica’s return to live action following a 6-week break from the road as they continue a spring trek across Europe that runs into early May. The dates will be interrupted when Major League Baseball’s San Francisco Giants host the 6th annual Metallica Night AT &T Park on April 23. “We'll take a quick break from the European tour to head back to the Bay Area and celebrate one of our favorite hometown traditions,” says Metallica. “Members of the band will be on hand to start things off right with the National Anthem and first pitch, sticking around all night to cheer on the team against the Washington Nationals. Ahead of the 6th annual event, the metal icons will reissue their 1987 collection, "The $5.98 EP – Garage Days Re-Revisited", on April 13.